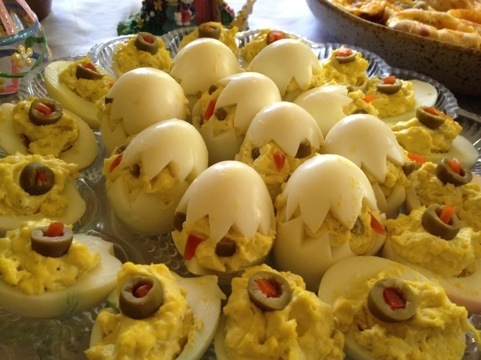 This year I brought deviled eggs to Easter brunch. I wanted to do something a little different and make them festive. I had seen several versions of these Easter chicks on Pinterest so I decided to give it a try. I made a zig zag cut through the egg whites with a sharp knife. I gently pushed the yolks out. I made my filling with mayonnaise, mustard and a little salt and pepper. I refilled my chicks using a small spoon. I took green olive slices and cut little pieces for the eyes and triangles for the beaks. They turned out very cute. Everyone was impressed and more importantly they were delicious. So there I was happily creating and blogging along when I was blind sided by some big news. My husband and I are expecting our third child in September. Along with the news of our soon to be bundle came the exhaustion and nausea of the first trimester. 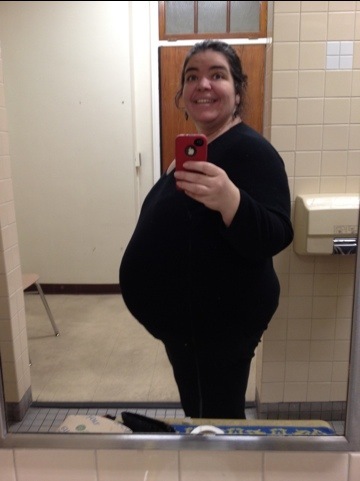 Thankfully now as the first trimester is safely behind me the nausea is gone and I have a bit more energy. So I am easing back into my normal routine of creating with and for my beautiful, and growing, family. Mix flour, butter/shortening, and milk. Add the rest of the ingredients and stir. I use a spoon and just scoop my scones out into a greased pan. If you want neat scones you could shape them into balls but my mom never did that. 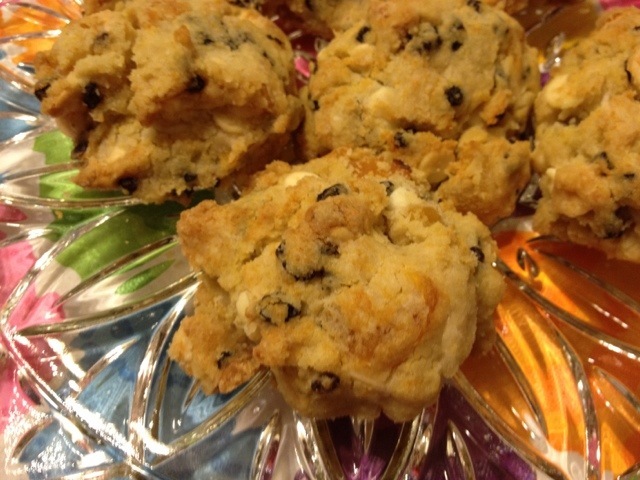 The scones go into a preheated 350 degree oven for 15-20 minutes until the tops are golden brown. They were so delicious and my three year old discovered a new love, white chocolate. 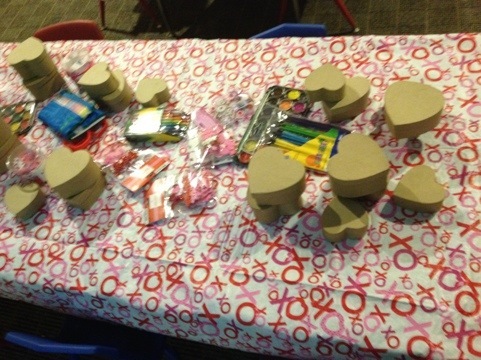 For my sons Preschool Valentines Day celebration we signed up for the craft. It seems to be our thing. 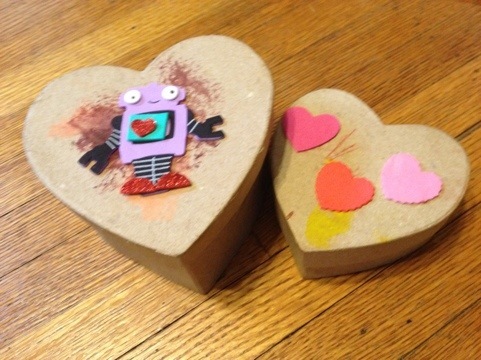 I decided to have the kids decorate heart shaped boxes. I found the boxes at the craft store (I had to go to 3 stores to get enough) the boxes were $1-$2 a piece. I brought water colors, markers, crayons and stickers. The kids had fun. 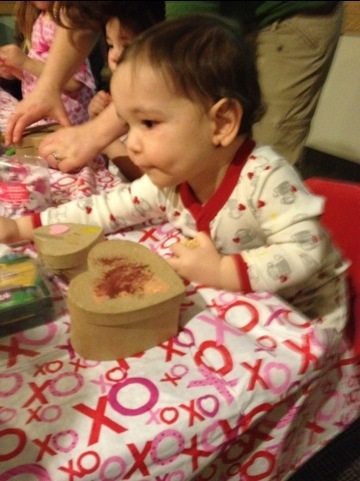 Everyone seemed to love the idea and most importantly my son Orion loves his heart box. His baby brother even got to make one too. 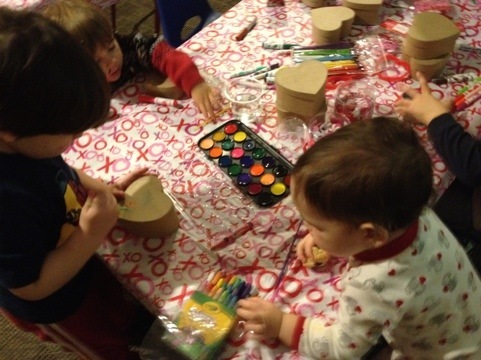 For my sons first Valentines Day at Preschool we made heart shaped rainbow crayons. It was easy and fun. We used crayons that were already broken and some that weren’t. 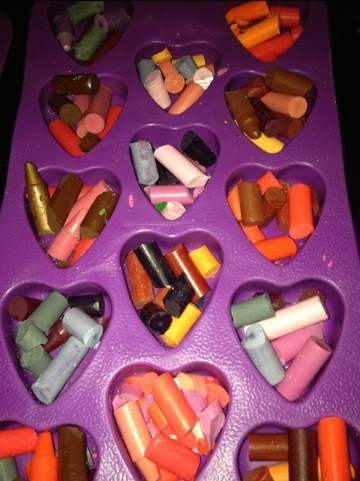 We broke them into small pieces and put them in heart shaped molds that I bought for a dollar at Target. We placed them in a Pyrex pan in the oven on 250 degrees for about ten minutes. Then because my son was anxious for them to harden I stuck them in the freezer for about a half an hour. Then I glued them onto card stock. 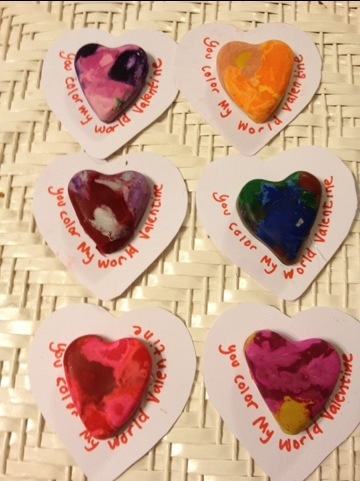 They turned out so cute and he was so proud of our homemade Valentines. For Gabriel’s birthday party I made two kinds of Chex mix. This one I named after his big brother Orion because they contain three of his favorite foods chocolate, Chex cereal, and peanut butter. 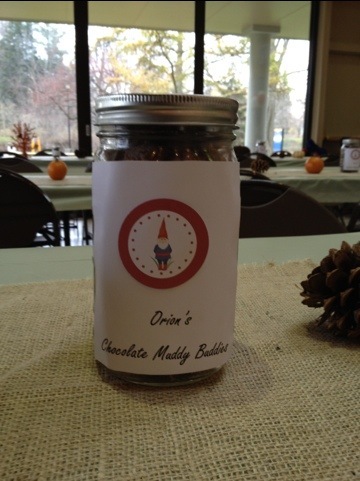 I called this mix Orion’s Chocolate Muddy Buddies. I printed out labels on cardstock and hot glued them to mason jars. 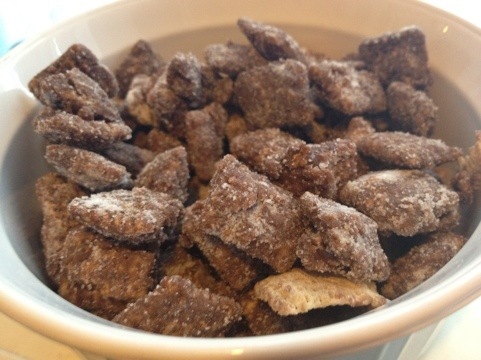 This recipe is also sometimes called Puppy Chow. In a microwave bowl microwave chocolate, peanut butter, and butter for one minute on high. Stir. Then microwave for another 30 seconds until mixture is smooth when you stir it. Stir in vanilla. Place all the cereal in a large mixing bowl and then pour the hot mixture over stirring until all the cereal is coated evenly. Pour cereal into large ziplock baggies add pwdered sugar and shake until the powdered sugar is coating everything. Spread onto wax paper to cool. You can then store it in the fridge. I made mine the night before and I just stored mine in large mason jars overnight. These little acorn cookies are so cute. I’ve seen many different versions. Probably the easiest involves using the mini pecan sandies from the 100 calorie packs. Since I can’t eat gluten I actually made my own mini sugar cookies. 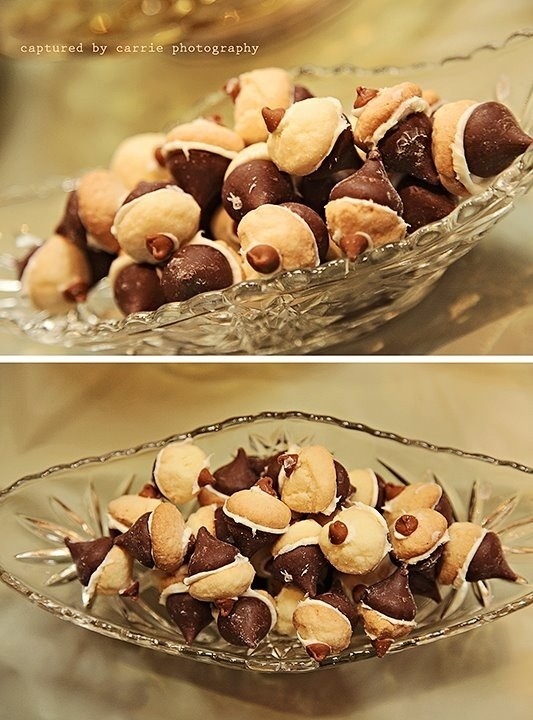 The cookies are attached to the hershey’s kisses using peanut butter or nutella or frosting. Because I made mine for a party and I didn’t want to chance anyone having a nut allergy I used frosting. Then I used a mini cinnamon chip on each one for the stem. They were so cute. Almost too cute to eat. 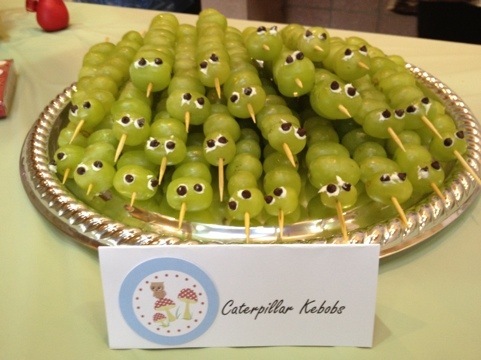 These little Catterpillar Kabobs are so cute. The kids loved them. It’s a great way to add a fun healthy snack to any party. I use bamboo skewers and put my grapes on sideways. The eyes are made of mini chocolate chips and held on with a dab of frosting. There wasn’t a single catterpillar left on the platter when the party was done. I had no idea when I decided to add this to the menu what a hit it would be. Several parents asked me how I got their kids to eat peas. This pasta salad is ridiculously easy and so delicious. I was really happy that everyone liked it so much partially because the pasta was gluten free. No one seemed to even notice. That’s it just mix everything together and serve. My three year old insisted that his baby brother needed green cupcakes for his party. So I thought frogs would be the perfect choice for a Magical Woodland birthday party. I made mint brownie frog cupcakes. I found small green cupcake liners and made mini frog cupcakes. I just followed the directions on the box. Mix mint extract and food coloring into the frosting. When the cupcakes are cool you can frost them first with a layer of frosting. Add two marshmallows to the top of each cupcake and cover completely with the green frosting. Use candy eyes and place on the front side of each marshmallow. The candy eyes can be found at craft stores or grocery stores. They turned out SO cute. Everyone loved them and what could be better than mint and chocolate?